As one can expect, Samsung's latest flagship Galaxy S III and its predecessor Galaxy S II are the top guns, holding a combined share of 17.4%. The mid-range Galaxy Ace is a distant third spot with 3% of the Android market, followed by the Note and the Note II phablets with 2.6% and 2% respectively. 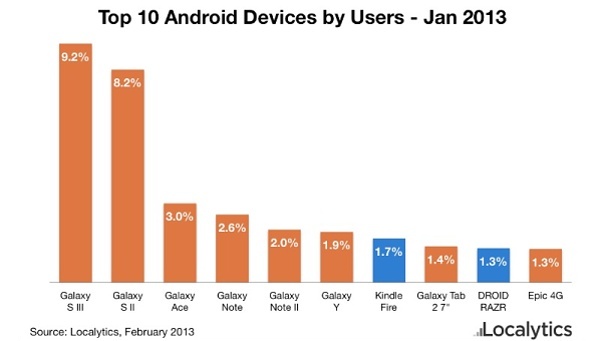 Amazon's Kindle Fire sneaks in the list with 1.7% of the Android users. The tablet is followed by the Galaxy Tab 2 7.0 with 1.4% of the Android devices. The other smartphones in the list are Galaxy Y, Droid RAZR and Epic 4G. According to the report, Samsung controls whopping 47% of the total Android market share.